The 'Monza Gorilla' started racing at a very late age but ended up a Grand Prix winner all the same - albeit in strange circumstances. Brambilla started his career with a March team on the decline. The constructor that became most famous for its customer cars was formed in 1969 by Max Mosley, Robin Herd, Alan Rees and Graham Coaker. The name is an acronym drawn from Mosley, Alan Rees, Coaker and Herd. But the founders weren't able to stick together for long, since they were at war over the purpose of the company. While Mosley and Rees wanted to build an F1 car for Jochen Rindt to race in 1970, Coaker was the team's driving force in building production cars. It forced Coaker to leave soon after the company's establishment. Dramatically, Coaker was killed in 1971, racing a March F2 car he had accepted as part of his leaving settlement. Thus, in March's first years the emphasis was on the works team. But when Rindt signed for Lotus, the works team had to go for its second option, snatching Siffert and Amon away to drive its first design, the 701. The first customer version was shipped to Ken Tyrrell, using it as a stop gap before his own 001 was ready for Jackie Stewart to use. JYS turned the car into a race winner in only its second race in Spain - but then he would win in a garbage truck. The works team and the rest of the March privateers struggled though, having to wait for success until the following season, when Herd designed March's most successful chassis, the 711. With an aggressive Ronnie Peterson behind the wheel it finished runner-up in the championship, albeit without winning a race. The peculiar 1972 car was a complete failure. The 721X was meant to be a low polar moment car around an Alfa gearbox but its drivers Lauda and Peterson couldn't get it to work. 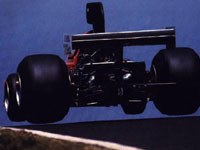 Only when the team saw the uprated F2 car for Mike Beuttler, called the 721G - for Guinness Book of Records, since the car was designed and built within a mere nine days - outclassed the 721X, even with a mediocre gentleman driver behind the wheel, it ditched the X in favour of the G version themselves. Up until 1976 March would stick to the idea of uprating its current F2 design to F1 standards. These were the days March's involvement as a customer car supplier in the lower formulae really began to boom, the attention for the F1 works team slowly faltering. In the end this led to the departure of Alan Rees, who went on to form Arrows with Jackie Oliver. Brambilla, who had joined the team in 1974, did bring the works effort its first success, being victorious in the rain-shortened 1975 Austrian GP, but only after spinning off on the straight and crossing the line with a severely bent nose. 1976 saw an upturn of fortunes when Ronnie Peterson left Lotus after just one race and was lured back to March, replacing Lella Lombardi in the No.10 car. A feisty drive at Monza won the works outfit their second victory but at the end of the season Peterson left for Tyrrell. Brambilla himself had scored just one point and was off to Surtees, taking his Beta sponsorship along. The tool company later emerged as Minardi's main sponsor for two seasons. 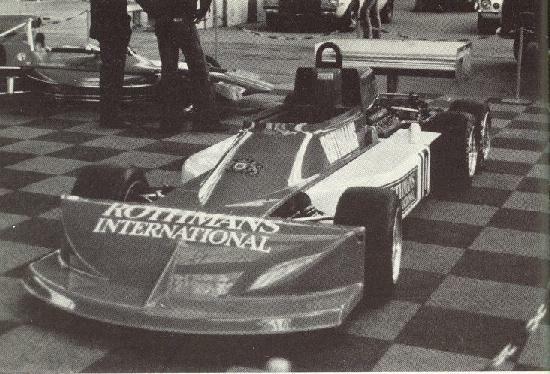 The March team dabbled around with a six-wheeler derivative of the 761 (with four wheels at the rear) before fading away in the 1977 season, with the untalented Ribeiro and Ian Scheckter as its driving force. Herd, and the March name, were tempted back into F1 in 1981 by the RAM team, but the Marches fielded in the two subsequent years had little to do with the extremely successful production factory, rolling out Indycars, CanAm cars and sportscars to its overseas customers.